We’ve got a new number one in town! While it is still very early in the season, there are plenty of teams defying expectations and shaking up the baseball world. The Mets and Angels are surprisingly atop their divisions while the Cubs, Nationals, and Dodgers continue to struggle. Where do these teams rank heading into the third full week of the season? Let’s find out! Biggest Jump: Seattle Mariners (8-5) This week’s power rankings have been defined by a lot of small movement across the entire board. That being said, the biggest jump, of just 4 spots, belongs to Seattle. The Mariners find themselves in the top ten in most offensive categories but their pitching is near the bottom of the league. If their line up, led by Robinson Cano & Nelson Cruz can continue to produce, and King Felix can figure it out and get the team’s pitching going, the Mariners should be in the Wild Card race all season. Biggest Drop: Los Angeles Dodgers (5-9) You won’t be able to see exactly how many spots the Dodgers drop this week, because they’re not in this week’s rankings. That’s right, they have fallen out of the top fifteen in the league. I’m assuming that they will figure things out by September but we can’t let their struggles slide. They find themselves in the middle of the pack in both pitching and hitting. Playing in a very deep NL West, the Dodgers better right this ship before they lose any hope of competing for the playoffs, let alone another trip to the World Series. More Notable Movement: Like I said, this week’s rankings show a lot of small movement everywhere. That small movement includes two teams, the Angels and Diamondbacks, finding their way into the top five. It also includes preseason juggernauts Yankees, Cubs, and Nationals continuing to fall, with the Nats falling out of the top five. I also have two new teams, the Cardinals and Rockies, in the rankings this week. 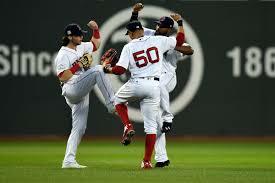 Boston Red Sox (13-2) ⇑(2) The Red Sox keep on rolling! Boston is off to their best start in franchise history as they hold the best record in the majors. They are proving to be one of the more rounded teams in baseball, ranking in the top five in seemingly every offensive category except home runs, and in almost every pitching category. The world expected the Sox to return to the old days of being the Yankees’ little brother, but it appears this team is little brother to no one. New York Mets (12-2) ⇑(5) Should I say it? Come on, we all want to say it! It’s Amazin’! The Mets are off to a fantastic start at 12-2. As expected, their pitching has been excellent. They are atop the National League with an ERA of 2.93. Their line up is still a little suspect with just a .237 batting average, but they are third in the NL in OPS with .742, so they are finding ways to outscore their opponents. This team’s health, especially that of their starting rotation, will be watched all season but as long as they stay healthy, the Mets are a force to be reckoned with. Houston Astros (10-6) ⇓(1) World Series hangover, anyone? I don’t think so. Well, not yet anyway. The Astros have lost three of their last four games, but they are still 10-6 so we can’t kick them out of the top five just yet. They are still the hardest team to score runs against as they hold a league leading 2.71 Team ERA. However, the Angels’ high scoring offense comes to town next week. If the Astros don’t shape up, they will lose ground in the race for the AL West. Los Angeles Angels (13-3) ⇑(6) That high scoring Angels offense I was just referring to is the best in baseball. They are number one in the league in batting average (.291), runs scored (103), OPS (.825), and just about every other offensive stat you could think of. Their pitching, while less scary, isn’t bad either. They have a team ERA of 3.19 which ranks in the top ten in the majors and top five in the AL. The Astros better watch out. The Angels are hungry for their first Division title since 2014. Arizona Diamondbacks (11-4) ⇑(7) The Angels aren’t the only new team in my top five. The Diamondbacks have quietly achieved the best record in what might be the MLB’s deepest division, the NL West. This team is finding a way to pitch in what is known as an impossible place to pitch. Their Team ERA of 3.12 is second in the NL, behind only the Amazin’ Mets (sorry). Their offense is doing okay so far. Their 77 runs ranks in the top five in the NL. Their line up could get even better when key hitters such as Paul Goldschmidt and AJ Pollock get their sea legs under them.